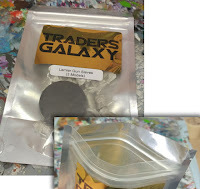 This week I'm taking a look at a company down under called Traders Galaxy. They've got a unique science fiction line of Dwerg, (Dwarves) Tamarin, (Chimps) Technomancy and what I'm looking at today - Cult of Lamiar. * Full disclosure, they provided a free unit for review purposes. 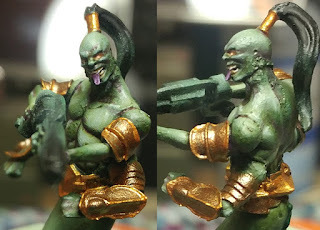 Above is the miniature I painted while writing the below review and to the left in more of a flesh tone is pictured the miniatures from their website. You're able to purchase directly through their webstore and despite being on the other side of the world, shipping was pretty quick. Their blog goes into some army background and even has some links to fan codexes people have written if you want to try these armies in Warhammer 40k. Read through the review below or scroll down to the bottom for the summary. I found the packaging pretty neat, in that they come in resealable bags. It means that you can put the parts back in their packaging if you're not making them all at once. The parts themselves are nothing unlike you're used to seeing. Metal, with some tabs to cut off. Detail is pretty good on the figures and cleanup is on par with other companies, mainly just some slight mold lines. There were a couple of rough spots in the metal. Took a little bit of filing and some green stuff filler. The torso fitting was nice, it allowed you to angle the upper body however you like. The fitting was hidden by the armour so it came together nicely. 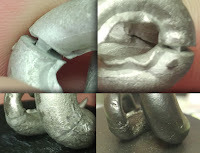 The arms also fit into ball joints so they also have some flexibility in the position you can glue them. Honestly, I wish more models used ball joints to customize how you pose your miniatures. I did have to trim the pegs that fit the snake parts together and even then there were some issues with them fitting cleanly together. (Which you'll see later also lead to a break after airbrushing.) The downside of the ball joints were that the arms had some visible lines where the shoulders are. 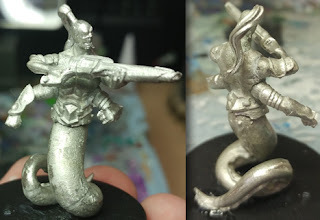 This kind of thing would work better if there was armour, but it's more obvious with organic miniatures. A neat workaround to this can be seen above in the example photo from Traders Galaxy - they ended up painting the joints obviously darker. Below, you can see the assembled miniature before painting. I used my airbrush to get a good sense of how the paint would hit the model. Just going for a tabletop level of quality for the purposes of the review and display something attainable. 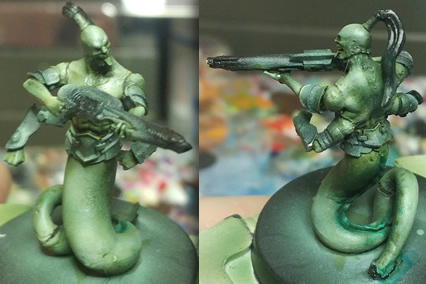 My approach was to prime black then work from a dark to light green. For the skin, I followed up with some purple deep tones on the skin. Nothing fancy on the armour, just a gold with a quick wash. In the final photos you'll notice I've painted some orange gems on the wrist armour as well. I didn't notice it when assembling the miniature, but there were imperfections in the skin that came out once paint was applied. Just some pits and rough edges. 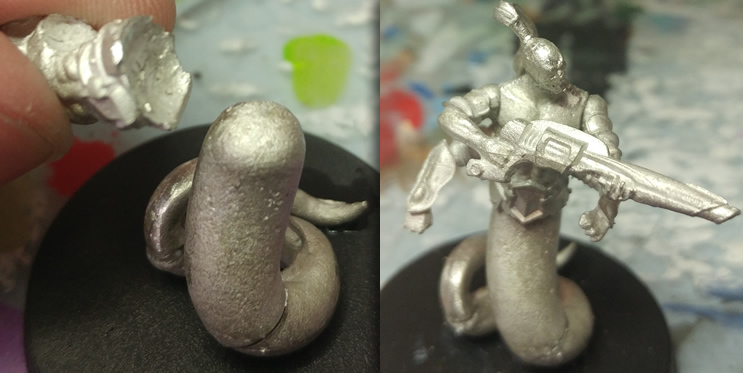 I liked the design as something fresh to paint, despite there being less detail on the figure than I'm used to. That said, this (and the rest of their line) would be excellent minis for newer artists who can be intimidated by miniatures that have a lot of details to tackle. Conceptually, I think the only thing that I'm not a fan of is the tongue sticking out, but that's just a personal thing. 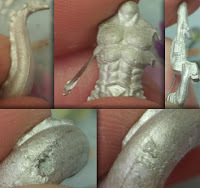 As outlined above, there are some imperfections with how the miniature fits together and with the surface of the model itself, but nothing that would hold you back or create a negative experience painting it. Prices on their website are in Australian dollars. From a cost perspective, you're looking at about $10 /model Canadian, less in US dollars. Seems to work out cheaper for the dwarves and larger units. Overall, I liked the model and find the rest of the designs available on the website pretty unique for a smaller studio. (Except for the Necrobot Hulk which resembles the something from Judge Dredd... though if you want a miniature ABC Robot, now you know where to find it.) 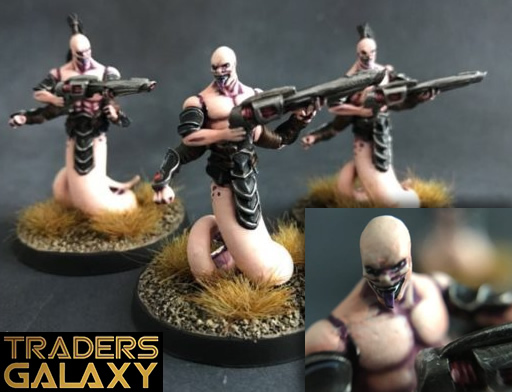 Traders Galaxy's style is reminiscent of the classic miniatures I painted when I was younger with improvements to the assembly and level of detail. If you like what you see, definitely jump over to their website and take a look. They're worth checking out. Have you looked at their shop? What do you think of their style?